March 27, 2011 Dan O. If this pill is actually out there, I need to get better dealers. With his writing career tanking and his girlfriend (Abbie Cornish) casting him off, ex-druggie Eddie Morra’s (Bradley Cooper) fortunes finally turn around when he’s given a mysterious drug that provides astonishing mental powers — but its deadly side effects threaten his sanity. Adding to Eddie’s misery are shadowy businessman Carl Van Loon (Robert De Niro), who wants to exploit his new genius, and the other users willing to kill for his stash. What if there really was a drug out there that could make you use all 100% of your brain? Well, I have a feeling that I would use it to more advantage than this guy did. Director Neil Burger does something here that should actually be rewarded, because he takes this material and brings it to life with his constant flair to the screen. He does a smart, creative job visually portraying the effects of NZT by using angles, lenses, colors, and all sorts of other effects to show how Eddie thinks and sees the world, thus putting us in the mind of him. The only let-down is that the script doesn’t do anything spectacular and brings this film down a whole bunch of notches. I liked the social commentary here about our desire to take short cuts for self-improvement, and our obsession of instant success. There is also little tidbits here and there of humor that works, but then the film changes about half-way through and starts to become a yawn. The film seems to play a back-and-forth battle between talking about the side-effects of the drugs on Eddie, and who knows about the drugs, and wants them. These two story lines just seem conflicted and take away from the overall effect of the film and actually bring it to more predictable territory which was really a bummer. Also, there were some action scenes here that worked, but they seemed random and just put in there to keep the film entertaining. Bradley Cooper has been going all around the film industry for awhile now looking for that perfect leading man role, and I think he may just have found it here as Eddie Morra. We never seen Cooper play a slobby loser, but he totally pulls it off making for a great contrast to him on NZT which showcases Cooper’s talents as a smooth-talking and charming handsome devil. By the end of the film, I don’t know what they were trying to do with Eddie here, because it’s like they were wondering if he’s a villain or not, but still Cooper proves that he can be a leading man, possibly a great one. Abbie Cornish has a couple of scenes here and there, and she does a good job, I just wish she was a little more rounded than the screenplay had her out to be. Robert De Niro has done some pretty crap movies lately, but Limitless uses his mobster persona well with him controlling every scene he’s in. It’s not a perfect performance by any means, but it just shows that signature stage presence that De Niro has and uses oh so well. Consensus: Director Neil Burger uses a lot of different and crazy visuals to effectively create a state of mind when on drugs, and Bradley Cooper is good in this lead role, but the script lets-down Limitless with its many missed opportunities, and confusing outcomes. Interesting analysis. I agree with your rave of Cooper. He’s really starting to hit his stride. I worry that Hangover 2 is going to be a step back for him. I hope it won’t but I could see that happening though. Nice review Dan, I would’ve given it the same rating. This was a film I was truly perplexed by, in terms of rating it. It has some signs of brilliance, yet it contains really smart people, doing really dumb things. 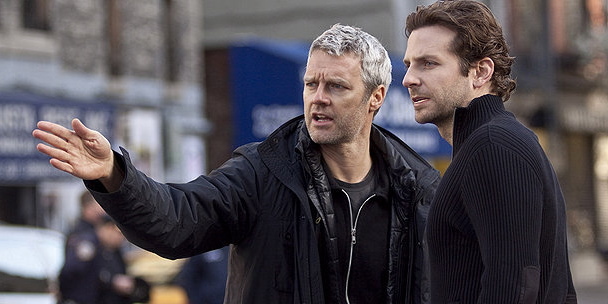 Regardless, the film will probably be an afterthought in about … 2 months. Good review! True, it was fun while it lasted, just didn’t really take me in that’s all. Thanks Sam! It is quite the rental! Check it out though! I think that’s actually where the movie shines (besides style). 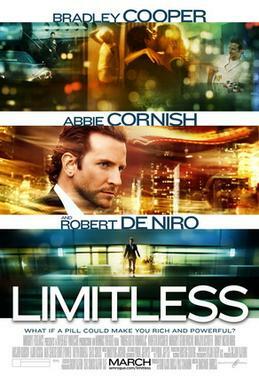 If you’re looking forward to it just because of the fantasy of having a pill like that, Limitless actually serves as a pretty enjoyable shallow “wish-fulfillment” type of fantasy piece like that. True, and that’s what I kind of took it as. True, but it was all pretty good! No problem, thank you for the comment! Good review (and thanks for checking out mine, as well :)). The script was definitely somewhat of a let-down, but unlike many movies with average/just below average scripts, this one actually distracted me a lot from it. That could be a good or bad thing, but when a movie has a clearly bad script, it is usually noticeable for me as the movie is going on, but Limitless only had this problem in retrospect (in my case). Though it’s definitely worth renting, I suggest seeing it in theaters, too, mostly because I’m sure the trippy effects will be a lot more…erm, trippy, and awesome, on the big screen rather than the small one. The trippy effects really did work when it came to effecting the audience, especially in the movie theater. Just all of it could have been better. Thanks! I think the Burger did a great job. The screenplay wasn’t perfect but in lesser hands this could have been a complete straight to DVD flop. The ending was kind of lame, and just sort of happened without any real impact on the whole film honestly. I agree Dan. I gave it a 5. Interesting concept, but pretty poorly handled. I would have liked to have learned a bit more about Morra’s character, and he was just so stupid to think he would be able to rise to such heights without the thought that there may be side effects, and those initially searching for the drugs might find him. Some glaring plot holes. But visually it’s quite innovative, and the performances were solid. Watchable, but pretty forgettable overall. It’s not a perfect film, but a pretty forgettable that could have actually been so much better, if it weren’t for the poor script. Thanks Andy! Secondly, I suppose I’m just an easy man to please when it comes to movies. However, you’re review does bring up some great points so props to you, sir. Thanks man! I enjoy movies too, it’s just that I always seem to find the flaws here and there. I’d say this is a pretty spot on review. The story and script of this movie were definitely lacking in areas. I had initially had expectations for this to be an intelligent thriller. Unfortunately, that’s not what we got, as it could’ve been brilliant with enough brains behind the script. All in all, though, it was still a fun movie that’s worth a watch. The visuals were definitely well done. I especially loved the color contrast between the “on NZT” Eddie and the “needing a fix” Eddie. As long as you clear your mind (as you mentioned on my review) of this being any type of intelligent movie that raises great philosophical points or anything like that, then it’s a fun ride. And as I said above, with those low expectations it does provide for an enjoyable wish-fulfillment type popcorn flick. It provides a lot of fun popcorn entertainment, but the script was lacking in many parts but somehow Burger seems to capitalize on that and bring some great visuals to this film. Thanks! Yea I think the lacking script does allow for him to go further with visual aspects and whatnot. Since the movie isn’t restrained by the necessity to be an intelligent thriller with brains, he could concentrate on being it being a visually striking “action thriller” style movie, where since you don’t have to concentrate on an intelligent script throughout, it can be turned into an adrenaline-rush type movie that can be a rush due to not having to worry about losing the audience. Yeah I agree that the movie was good fun and it definitely gave Bradley Cooper the opportunity to step up and show his leading man potential. I think big things will follow for Mr Cooper. As promising as the story was I don’t think it achieved its full potential and made it an outstanding film but rather an interesting good film. It could have went into farther territory, but instead just stayed a little too normal, and didn’t do much that was amazing. Thanks! It’s difficult to find experienced people for this topic, but you sound like you know what you’re talking about!